"Anyone who fights with monsters should take care that he does not in the process become a monster. And if you gaze for long into an abyss, the abyss gazes back into you." Amid the frantic, nonstop media coverage of the Boston Marathon bombing, another equally horrific news story was, perhaps predictably, overshadowed. A nonpartisan, independent review commissioned by the Constitution Project confirmed what many of us had long known: The United States, in the years following the Sept. 11, 2001 terrorist attacks, deliberately and knowingly engaged in torture. 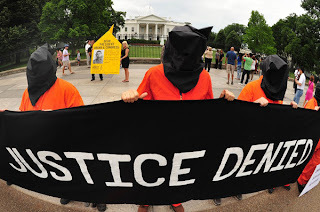 The nearly 600-page report concludes the U.S., in the aftermath of 9/11, “indisputably” engaged in “the practice of torture,” and that the highest officials within the Bush administration bear responsibility for it according to The New York Times(04/16/13). The authors of the report called the widespread use of torture unprecedented. “[There had never before been] the kind of considered and detailed discussions… directly involving a president and his top advisors on the wisdom, propriety and legality of inflicting pain and torment on some detainees in our custody,” the report states. This is certainly not news for most citizens. Most Americans—whether they approve of such heinous practices or not—at least have some inkling of the government’s use of so-called “enhanced interrogation techniques.” But the panel’s report should finally put an end to any remaining debate or uncertainty (most of it generated by the corporate media) that still surrounds the issue. A poll conducted last fall by Professor Amy Zegart of Stanford University’s Hoover Institution finds 41 percent of respondents support the use of torture in questioning designated “enemy combatants”—an increase of 14 points since 2007. An additional 25 percent believe it is acceptable to use nuclear weapons to combat terrorists, while a whopping 69 percent favor killing suspected terrorists outright through targeted assassination programs. Zegart attributes the steady climb in support for torture (which, curiously has increased, rather than decreased during the Obama years) to popular portrayals in shows like 24 and this year’s Oscar nominated film, Zero Dark Thirty. I believe it has more to do with the simplistic dichotomization and overalldumbing down of our political culture. But pop-culture’s pervasive glorification of sadistic acts of torture by rugged heroes like Jack Bauer likely does not help. Torture is never justified. Never mind its proven failure to solicit accurate, useful information from its victims. Torture represents the ultimate debasement of one’s humanity. Those who resort to torture succumb to the most savage, sinister urges of human nature. But torture is more than just brute, physical harm. As Naomi Klein explains in her superb book, The Shock Doctrine: The Rise of Disaster Capitalism the torturer’s ultimate goal is to psychically erase the prisoner’s identity and create a new one from scratch. Psychologist and shock-therapy innovator, Ewen Cameron, sadistically used electroshock treatment on his patients in an effort to literally wipe their minds clean—to create a “blank slate” onto which he could start anew. This is how the totalitarian Party finally “reforms”Winston Smith in George Orwell’s 1984. “We shall squeeze you empty and then we shall fill you with ourselves,” O’ Brien tells Winston during the novel’s grim and lengthy torture sequence. And so they do. By the dystopian novel’s end, the rebel Winston finally pledges his unwavering loyalty to Big Brother. Left Forum: I'll be on a panel there. I might also be selling t-shirts. Be sure to swing by and say hello. Does the US Forest Service love fracking? 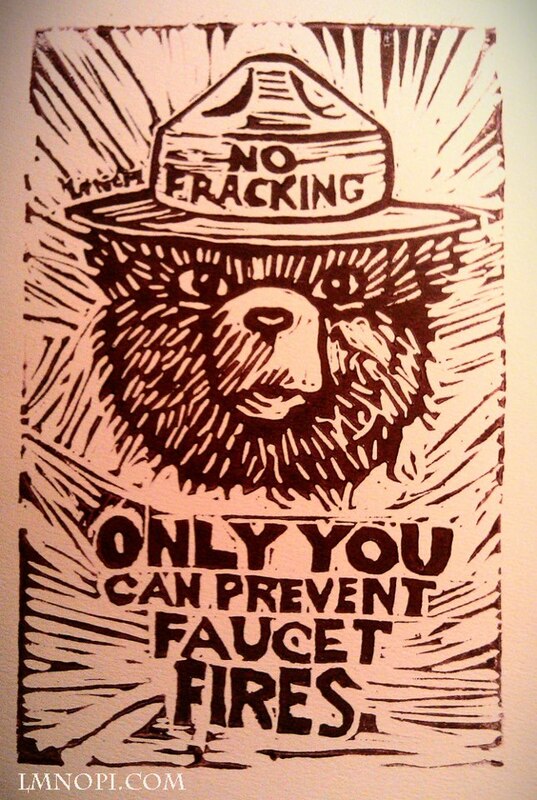 In case you didn't know, the US Forest Service is currently pursuing charges against environmental activst, artist (and Green Party member) Lmnopi for an anti-fracking parody she made. You can check out her store here. SUBJ: Does the US Forest Service love Fracking? Just wondering if you guys love fracking or something. It just seems weird that you would be pursuing charges against an environmental activst/artist who has a design that is CLEARLY a parody (and I'm confident you're going to lose your case), and not a plagery of your precious anti-forest fire cartoon bear spokesperson. Is the environmental damage from fracking less permenant and widespread than forest fires? I can't wrap my head around what your angle is here. 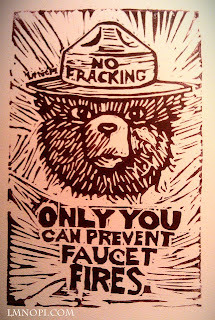 If smokey were a real bear, and could understand that fracking is the reason he's getting cancer from eating fish that swim in contaminated streams, he'd be PISSED. So I have to ask again, does the US Forest Service love fracking? now in Spain. It worked in Iceland. Ranked choice or Approval voting to replace the "first past the post"
on clean elections funds in the next election). don't need to know that. We will give them the opportunity to fail. 4) we take direct action demanding they make good on their promises. narrowly focused Occupy demands for electoral reform. c) as soon as their narrow policy goal is achieved, RESIGN. every party primary, and then in the general election as well. stragey as well to counter. in Spain, but I don't think it should be removed from the toolbox. Update: CISPA passed the House in a surprise vote on Thursday evening. You can still take action below, but now the fight moves to the Senate. We will have more updates soon. On the heels of the SOPA and PIPA comes a new debacle, the Cyber Intelligence Sharing and Protection Act (CISPA), which gives the intelligence community and private businesses free rein to delve into any citizen's everyday internet activity. CISPA allows companies and the government to bypass existing laws in order to monitor our communications, filter content, or potentially even shut down access to online services for undefined “cybersecurity" purposes. But what it doesn't do is provide any new protections for critical infrastructure systems, like electrical grids and water supplies. Some security that is! The anniversary of the Deepwater Horizon disaster. Human Cost, Tate Britain Performance – First anniversary of the Gulf of Mexico disaster from You and I Films on Vimeo. No need for a draft. All you basically need is an NRA membership and you're on the front lines right after boot camp." I could put the same question to supporters of Barack Obama. While liberals and many congressional Democrats cried out in dismay, Obama’s latest political maneuver should come as no surprise to anyone who has been paying attention. The president first offered Social Security and Medicare cuts during 2011’s debt negotiations as part of a so-called “Grand Bargain” with House Republicans. A Grand Betrayal is a more accurate term. Well, turns out we got both those things and we are still headed for catastrophe. But remember: Mitt Romney would have been so much worse…! Over at The Washington Post, meanwhile, Dana Milbank mocked socialist independent Sen. Bernie Sanders for his vocal denouncement of Obama’s plan to cut social services.“For Sanders,” Milbank writes, “…the betrayal stung so badly that he literally took to the streets, joining left-wing activists for a protest…outside the White House” (04/09/13). [I]n reality, the progressives’ street protest did Obama a favor. He needs to have the likes of Bernie Sanders against him. It strengthens his hand and helps him negotiate a better deal with Republican leaders, who can now see that liberal backbenchers and interest groups can sometimes be as intransient as conservatives. But “reasonable” to whom…? Poll after poll shows the majority of Americans—liberals, conservatives and independents alike—strongly support Medicare, Medicaid and Social Security. In fact, a poll in Milbank’s own paper last summer (08/21/2012) found a mere 17 percent favor cuts to Medicare, while 21 percent support cutting Social Security. In other words, there is no middle on this issue. It is the president’s budget that is extreme—not those opposing it. Social Security does not contribute one dime to the federal deficit. And contrary to Washington talking points, there is nothing wrong with Social Security’s overall sustainability. (It may need some minor tweaking down the road, but the program is structurally sound.) Medicare, likewise, is projected to remain financially viable until at least 2024 and even then there will still be enough in the fund to pay 87 percent of benefits. Even if these social programs did add to the deficit (which, again, they don’t)…So what? The deficit is a red herring—a distraction. The notion that, in the midst of the worst financial crisis since the Great Depression, we must focus solely on paying down the national debt is idiotic. Paul Krugman is (mostly) right: The U.S. government should be paying more money to stimulate the economy and encourage job creation—not looking to cut benefits Americans have paid into all of their working lives. The debt is a problem to be certain and we should deal with it at some point. Right now, however, it is a major distraction from our nation’s real dilemma—mass unemployment. Meanwhile, as working-class, elderly, poor and disabled Americans are being asked to sacrifice these earned income benefits, corporations like General Electric and Pfizer continue to enjoy myriad, extravagant types of corporate welfare in the form of bailouts, subsidies, off-shore accounts and tax-cuts. As I write this, it is Tax Day and G.E. has not paid any income taxes since 2010—possibly even earlier. And G.E. is just one of dozens of other multinational corporations that make record profits but pay virtually no taxes. But you and I still have to. Liberals’ feigned outrage over Obama’s budget is just that. The president is merely doing what he has, for two years now, said he would do. Chris Hedges is right: The liberal class believes in nothing. And now, it appears it is getting what it paid for. Adam Marletta is a writer, activist and coffee-fiend. He is the former chair and current secretary of the Portland Green Independent Committee and editor of the political commentary blog, Guerrilla Press. He lives in Portland, Maine and supports all things Green Party. 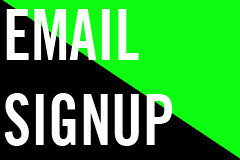 Please Vote to Send me to Netroots Nation 2013! If it's illegal to tell the truth, break the law. Yesterday, activist indy news team JNL RadikalMedia did what the mainstream media won’t or can’t do, providing exclusive video from the scene of Exxon’s oil pipeline spill in Mayflower, Arkansas. The video shows what can only be described as a lake of oil. Allegedly Exxon has been pumping the spill into this area. Exxon’s absorbent pads aka paper towels can also be seen scattered across the ground. Originally the FAA issued a no-fly zone over the area, but after major scrutiny, particularly from online activists, they partially lifted order, allowing news organizations interested in filming from the air to do so. The same does not go for media trying to cover the scene from the ground. Reporters say Exxon has threatened to have them arrested for merely entering the spill site. Even then, I was skeptical of the rationales for the invasion. I remember getting into heated debates with fellow students over the war. And I will never forget how even many of the campus liberals bought, hook, line and sinker, the bogus allegations of Iraq’s stockpiles of WMDs—how they too, waved the American flag in favor of war. Many of those same liberals have, in the years since the war’s start, naturally changed their tune. Some will even claim that they too, opposed the war from the start. But I was there. I know better. In the ten years since the start of the Iraq War—an illegal, unjustified invasion based entirely on lies and deliberate fabrications of evidence—it is frustrating to watch the U.S. media repeat the same uncritical, stenographic reporting that helped launch the war. Indeed, recent news coverage of Iran and Syria—replete with renewed claims of both countries’ alleged nuclear and chemical weapons—suggest the corporate media have learned quite little. The press’s failure to debunk—or even offer the remotest of skepticism—to the Bush administration’s bogus war rationales has been well documented. Now the saber-rattling media have turned their sights on Syria and Iran. Reports of Syria’s government using chemical weapons on rebel fighters in the country’s ongoing civil war could lead to a more pronounced U.S. involvement in the conflict. Speaking in Israel last month, President Obama called the use of chemical weapons a “game changer,” according to The New York Times (03/21/13). With Israel now expressing concerns over Syria’s alleged chemical weapons, some fear a broader American commitment in Syria may be on the horizon. Anybody else feeling a sense of deja vu, here? Any logical person, after reading this sentence would, one imagines, wonder what accounts for the article’s remaining 23 paragraphs. If there is no actual evidence of chemical weapons use, then what is the story, here…? Well, in typical both-sides-are-valid-facts-be-damned, “objective”reporting, the story is that Israeli government officials, despite the complete lack of tangible, verifiable evidence, nonethelesscontend Syria possesses chemical weapons. Well, that pretty much satisfies the five reporting “W”s. What is most curious about these anonymous “senior Israeli officials,” is their remarks seem to contradict those of Israeli cabinet ministers, Tzipi Livni and Yuval Steinetz. The story notes how both leaders have taken to the airwaves recently, claiming to have “credible evidence” of Syria’s use of chemical weapons. Israel’s government is keen to move from the air strikes against Syria to a more full-scale offensive, with the possibility of seizing more Syrian territory as a “buffer zone” being raised, even though Israel already took a buffer zone in 1973 and never gave it back. As for the U.S. and Israel’s next potential target,Iran, again the media seems determined to repeat the mistakes of Iraq. Despite what you may have heard on mainstream television news, there is actually zero evidence that Iran is currently developing a nuclear weapon. Last year, Secretary of Defense Leon Panetta publicly admitted as much. The Israeli newspaper, Haaretz even conceded the lack of evidence in a 2012 story. The article states: “The intelligence assessment Israeli officials will present later this week… indicates that Iran has not yet decided whether to make a nuclear bomb” (01/18/2012). And a 2011 reportissued by the International Atomic Energy Agency (IAEA) offered the same conclusions. Have the U.S. media learned nothing from the last ten years? Sad to say, but drumming up support for unnecessary, immoral and illegal wars seems to be one of the few things the corporate media can be counted on for. or, vote green, or why bother?